Anyone else out there have an intense love of pretzels in their chocolate chip cookies? Maybe it's just me, but that crunchy saltiness seems to go marvelously well with chocolate chip cookies. It's seriously yummy! Well, last time I was making cookies, I had a brilliant idea. I didn't have any regular pretzels in the house, but I did have pretzel crackers/pretzels thins, whatever you want to call them. I started breaking them up to put into the dough when I thought, "oooo, it'd be so good to just sandwich the cookie dough between to pretzels!" And I was right--extra crunchy goodness, perfect amount of salty and sweet, crunchy and chewy. Brilliant. We gobbled those cookies right up. Kind of a fancy and different twist on a classic cookie. Super easy to pull-off too. Here is an image of the dough sandwiched between cookies before going into the oven. You may have to tinker around a bit to get the right amount of dough-to-pretzel ratio depending on your personal preference and your cookie recipe. In the image above, that amount of cookie dough ended up being too much: it spread well beyond the pretzels, so the next batch I cut back on the amount of dough used and it was perfect (what was photoed in the first two images). 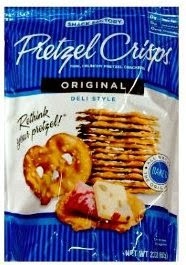 So, buy yourself a bag of pretzel crisps. I can't believe how much I want one RIGHT Now.